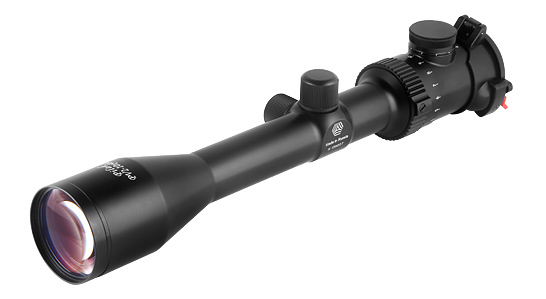 The all-metal body of the scope provides shock resistance on using. Hunter can change magnification from 2 up to 10. Optical parts of the cope have got multiple antireflection coating, therefore possess powerful light-gathering ability. The length of fitting part of the scope is longer, it allows to choose optimal support and provides necessary distance from eyepiece of the scope to shooter’s eye. Illuminated red reticule of PV2-10x48L has got 9 brightness levels.